The calligraphic tattoo on Omar Musa’s right arm says it all: Penglipur lara. In Malay it has multiple meanings but in its simplest terms, it translates to ‘storyteller’. It’s something Musa was born into to a great extent. His mother, Helen Musa, lectured in theatre at Malaysia’s Penang University and directed the first Malay language version of Shakespeare’s Hamlet. His father, Musa Bin Masran, a noted poet in Malaysia, acted the title role. They moved to Australia and Musa was brought up in Queanbeyan on the outskirts of Canberra. Growing up, Musa’s mixed race heritage made him the focus of playground bullies. Looking for inspiration, he came across the story of boxer Muhammad Ali. The rebel champ quickly became his hero. Inspired by rappers Chuck D, Nas and Ice Cube, Musa turned to rap as a vehicle of expression. He developed a distinctive, laid-back yet flowing style. “Sometimes people get very obsessed with technically complex rhyme schemes and speed,” he told journalist Mark Mordue in an interview in The Australian in 2014. “They say it’s lyrical, but really it’s just technical. Musa is also an award-winning poet and novelist. To date he has published three books of poetry – The Clocks, Parang and 2017’s Millefiori – which takes its name from the colourful Italian glassware often seen in paperweights. Omar Musa’s stage performance, Since Ali Died, is an attempt to create “something fresh” he says. 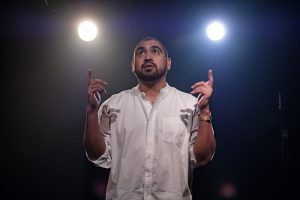 First seen in Sydney in Griffin Theatre’s Batch Festival in April 2018, Since Ali Died rocked the critics. “ … the show unfurls like the river imagery in Musa’s evocative script: borne on a central unstoppable current, fluid and fluent in a style of its own making,” wrote Cassie Tongue in her Time Out review. 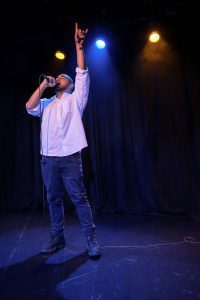 Omar Musa performs Since Ali Died at Riverside Theatres, Parramatta, as part of Sydney Festival, January 22 – 25 2019.